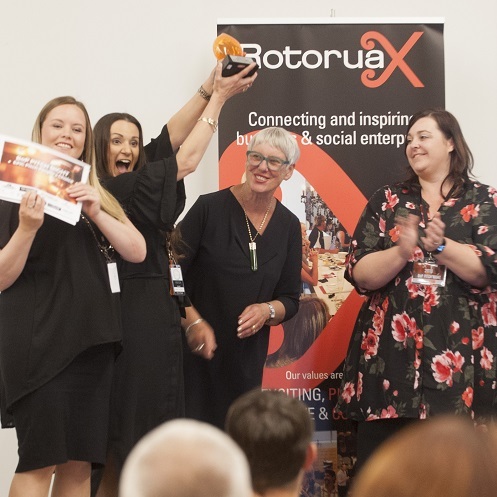 In front of a packed room StokedNZ and Little Love Foundation were the best pitches in the eyes of judges and the audience at the Rotorua X 2018 BoP Pitch Night this week. Debs Brockelsby from StokedNZ delighted the crowd with her dry sense of humour as she showed off her functional outdoor kit that lets you get changed or dry anywhere, anytime. Tammy-Lee Holmes and Cara Farrelly from Little Love Foundation won People’s Choice as well as the Judges Runners Up Pitch Award. Their pitch moved the audience to tears with their passion to help with the financial side of losing a baby or young child. Both organisations took a share of the $11,000 prize pool of business support services, mentoring and training. This was the event’s fifth year and provides an opportunity for the region’s commercial and not-for-profit organisations to practice their pitch and showcase what they are doing to the business community. Awareness of the event continues to grow year on year with people travelling from Taupo, Tokoroa and Palmerston North specifically to attend. The esteemed judging panel included mayor Steve Chadwick, Michelle Templer chief executive of Rotorua Economic Development Limited, Mark Copeland principal of commercial lawyer firm Mark Copeland Lawyers, Dr Leon Fourie chief executive of Toi Ohomai Institute of Technology, Catie Noble president of Taupo Business Chamber and Jasmin Jackson chair of Ka Pai Kai Rotorua and winner of the 2017 Pitch Night. Head judge Steve Chadwick said she it was lovely to be at the event for five years in a row. Announcing the overall winner, she spoke on behalf of all the judges and said that they didn’t need to confer, once the judges scores were tallied up there was a clear winner. Debs Brocklesby said winning was so unexpected as they were up against some stiff competition. The Little Love Foundation had set their goal on the People’s Choice Award and were surprised and delighted to also get the Judge’s Runner-up award. “Thanks Rotorua, for sharing a little love,” Tammy-Lee Holmes said. Video of all the pitches from the evening can be viewed on the Rotorua X Facebook page. Pitch Night was developed to help foster an entrepreneurial community in Rotorua to support businesses to launch and grow. The evening was only possible through the event partners Firestation, Toi Ohomai Institute of Technology, Rotorua Energy Charitable Trust and Rotorua Economic Development Limited. As well all the organisations that provided goods and services as prizes. Debs Brockelsby from StokedNZ – Functional towels (‘Towelies’) that enable you to get changed anywhere, wherever and whenever without flashing anyone. Tammy-Lee Holmes and Cara Farrelly from Little Love Foundation – helping families with the financial side of grieving for a young child. Bruce Norman from Kiwi Pod – burial pods made from recycled materials with a range of graphic designs applied to the outside for aesthetic and cultural appeal. Laurens Goormachtigh from Chess Minds – getting children and adults to enjoy chess and experience the benefits of improved decision making and strategic choices that it can bring to other areas in the players’ life. Te Rangikaheke Kiripatea from Kai Rotorua – help people reconnect with healthy food by growing and selling kumara and riwai with bigger plans to develop a food hub. Heather Kremen from Amokura Glass – Rotorua’s only glass blowing studio. Danielle Campbell from SponsorHubNZ – a match-making service for small business and non-profits to facilitate sponsorship arrangements.